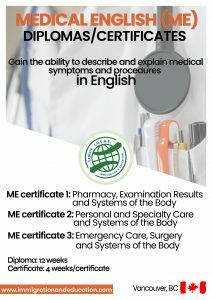 An intensive program designed for medical students and professionals who want to develop their medical English. Gain the ability to describe and explain medical symptoms and procedures in English. Learn to communicate effectively in medical situations. Certificado de 4 semanas: $355 CAD por semana. Diplomado de 12 semanas: $340 CAD por semana.